Although smaller community hospitals may provide treatments that are as good and as safe, Americans flock to academic medical centers for specialized care and complex procedures. They’re lured to the big, pricey institutions by their stellar reputations, state-of-the-art facilities, and top-line specialists. These tall, shiny complexes, combining medical education, research and clinical care, also have deep roots in their communities and become political powerhouses in their own right. Puliafito, 66, and these much younger acquaintances captured their exploits in photos and videos. The Times reviewed dozens of the images. Shot in 2015 and 2016, they show Puliafito and the others partying in hotel rooms, cars, apartments and the dean’s office at USC. In one video, a tuxedo-clad Puliafito displays an orange pill on his tongue and says into the camera, ‘Thought I’d take an ecstasy before the ball.’ Then he swallows the pill. In another, Puliafito uses a butane torch to heat a large glass pipe outfitted for methamphetamine use. He inhales and then unleashes a thick plume of white smoke. Seated next to him on a sofa, a young woman smokes heroin from a piece of heated foil. The newspaper also found that the doctor had prescribed medications for his young pals, including asthma inhalers for those who complained of breathing problems due to their smoking of marijuana and other intoxicants. As the fury grows on campus over the former dean’s shenanigans, the university has reacted haltingly and poorly to this public black eye, made worse because Puliafito—who had stepped down as dean to join a high-tech medical products startup that did not succeed—had stayed on the med school faculty. Though he has gone on leave and isn’t doing so now, he was still accepting and supposedly treating patients (the paper has made clear that it has found no indication that his extracurriculars affected his medical treatment and his pristine practice record). Moreover, he was still representing the medical school, a critical part of a giant health system that is growing by leaps and bounds across Southern California as hospitals consolidate to seek economic efficiencies of scale. Days after the newspaper published its tip-based scoop, USC’s president wrote to the university community, saying he was limited in what he could say about the former dean due to employment and medical privacy issues. He said substance abuse is a recognized problem for doctors and high-powered professionals, and USC and Keck offer programs to assist. 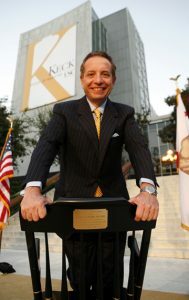 He would not say if USC had complained to medical regulators about its former dean. But the Medical Board of California, which licenses doctors in the Golden State, has said it has opened a confidential investigation that it cannot discuss further into Puliafito. Police in Pasadena also announced that they had disciplined an officer who had investigated a drug overdose in an upscale hotel room where Puliafito was staying and involving one of his young female friends, who since has gone into rehab. Officials declined to provide specifics but the Los Angeles Times noted that police seized illicit substances during a cursory investigation of the overdose, and officers could have charged individuals in the hotel room with their possession. How much will this case tarnish USC, its medical school, or its health system? Hard to tell but this case gives a glimpse into the high-stakes practices in institution building. Puliafito was a reputation master, moving from posts in Boston and Miami to one of the West Coast’s elite perches in academic medicine. He pulled USC’s med school rankings up by at least a half dozen spots, experts say, recruiting more than 70 professors—and engaging in a still unresolved major legal fight with the University of California at San Diego over a prized Alzheimer’s researcher with a grants portfolio in the hundreds of millions. The Los Angeles Times also has published photos of the dean chumming it up with celebrities like Jay Leno, Warren Beatty, Annette Benning, and Shirley MacLaine, as well as Southern California civic leaders and politicians, and executives like onetime Hollywood studio chief Brad Grey and tech mogul Larry Ellison. Research suggests that academic medical centers can help patients with intensive and specialized needs, often due to factors such as the complexity and volume of cases they treat. But their costs can be higher—and hefty. Big institutions also carry big budgets to market themselves, hyping their doctors, facilities, and specialized care. Similar medical services may be available at equal quality and result, lower cost, and greater convenience. But as economists have pointed out, emphatically, irrationality plays a huge part in medical decision-making. It pays for patients, as their time, patience, and resources allow, to research robustly. They still may be unduly swayed by medicine’s big names in hospitals, doctors, and medical schools. Consumer advocates have sought to make hospital choices, in particular, easier and more efficient, for example, by collecting key data and distilling it into star- or letter grade-ratings. This isn’t a flawless system, and, indeed, U.S. News and World Report, the onetime news magazine and one of the biggest and best-known raters around, has put off formally releasing its annual scores after finding undisclosed issues in its proprietary data. Editors say they’re triple checking their information and will put it out in August when they have greater confidence in its accuracy. U.S. News’ scores had been sent already, as is the case each year, to select audiences, including hospitals, under embargo. Good for the publication for holding off to check its data, especially since hospital ratings vary greatly, and even may be adding to consumer confusion. The publication’s top five hospitals last year included the Mayo Clinic, Cleveland Clinic, Massachusetts General Hospital, UCLA Medical Center, and Johns Hopkins. Only Mayo got a comparable top rating from the Centers for Medicare and Medicaid Services, which ranks more than 4,000 hospitals nationwide by stars. It’s also worth noting that here in the Washington, D.C., area, the clinical center at the blue-chip National Institutes of Health is still recovering from safety and treatment concerns as well as reputational woes that blew up after fungus contamination was found in a pharmacy at the Bethesda, Md., campus. Dr. Francis Collins, the NIH director, called in external reviewers, then shook up the leadership to improve, he said, the institution’s focus on institutional oversight, and especially patient care and safety.Despite those changes, clinical staffers, via an audit, have told the NIH board that they have persistent worries about “poor management and communication, lack of accountability, and outdated equipment” at the center, potentially putting patients at higher risk.